When researching our itinerary on the island of Java in Indonesia, we knew we had to see the volcanoes. 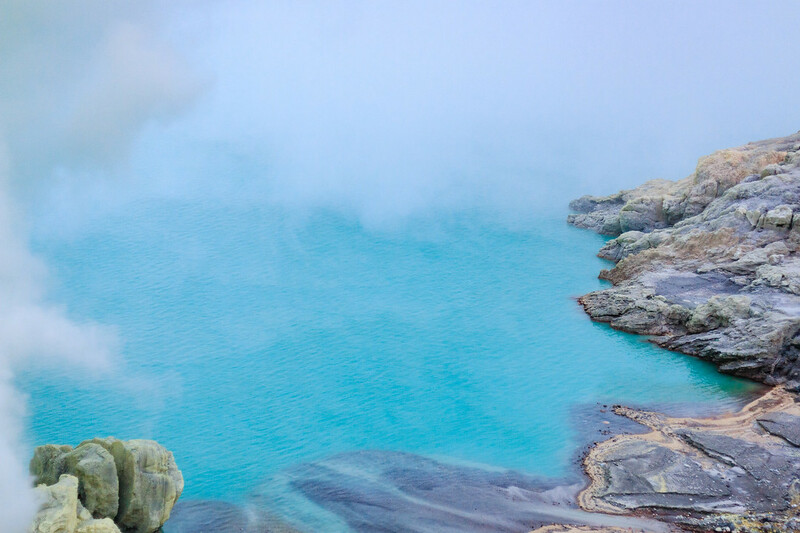 Mount Bromo was already on our Top 100 list but we also wanted to see Ijen volcano. Time was running and we thought we wouldn’t have enough time to visit both volcanoes. 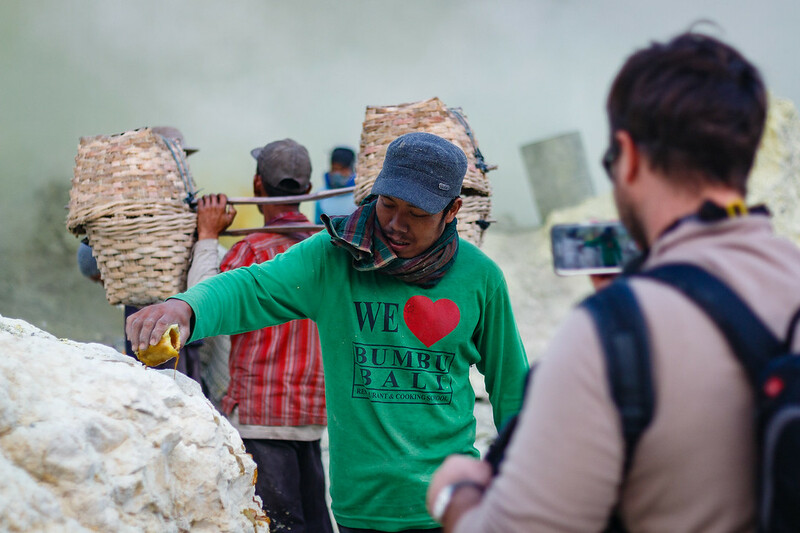 We asked around whenever we met someone who had done both, and most of the time people would recommend Ijen over Bromo for the human experience, to meet the sulfur workers. We couldn’t decide. 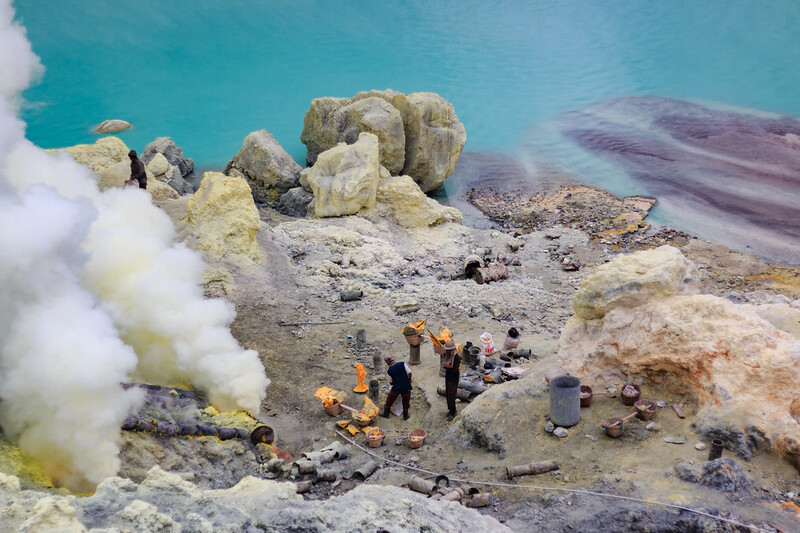 Bromo or Ijen ? So we did both. 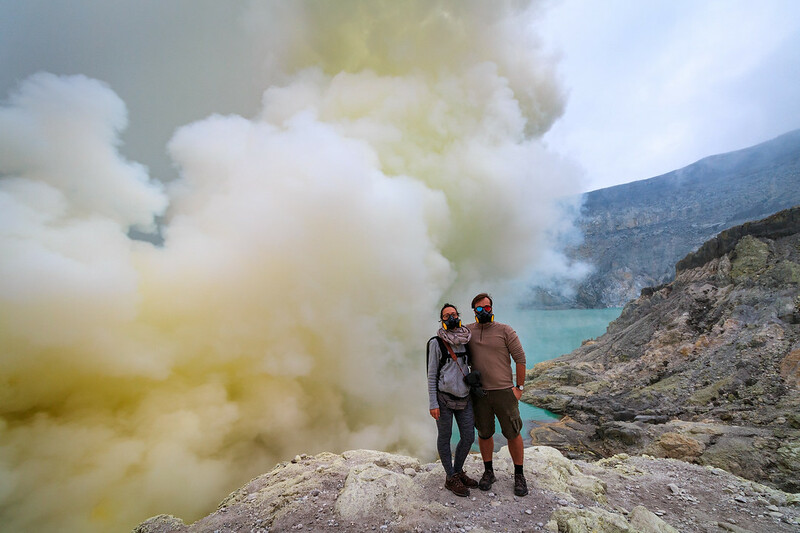 Here are our best travel tips and info we wanted to share with you on how to see the blue flames and hike up to Kawah Ijen on your own, without a guide or a tour. Train from Probolinggo to Banyuwangi : we paid 450.000 rupiah for 2 tickets in Executive class (1st class) on tiket.com. Economy and Business class are obviously cheaper. Having tried both Business and Executive class, I don’t recommend you Executive as it is exactly the same as Business, only a bit more expensive. We didn’t try Economy but I am sure it is not as bad as everyone thinks. There are several train station in Banyuwangi, make sure you choose the one closest to your hotel. 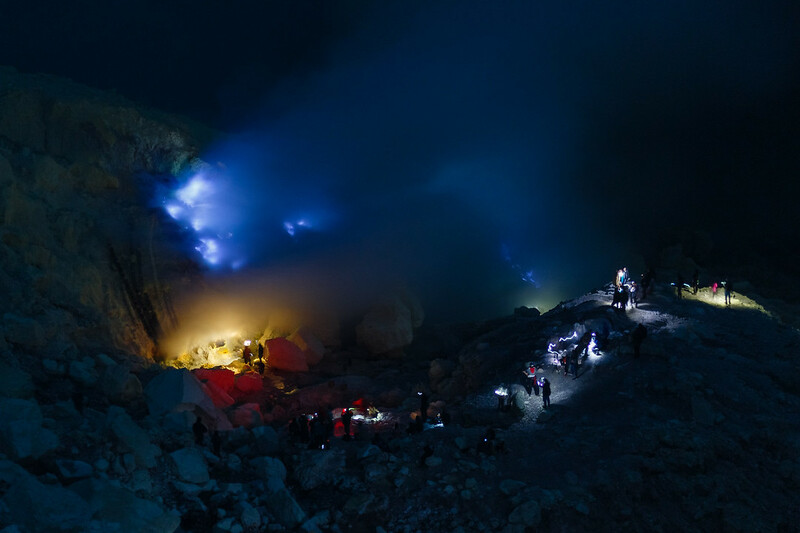 Going to Ijen volcano from Bali is very easy and straightforward. Bus to Gilimanuk : around 40,000 rupiah per person, leaving from Denpasar bus station. The large buses are much more comfortable and cheaper than the minivans. If you plan to travel to Bali after visiting Ijen, do not let you fool by the minivan and bus drivers who will hail you at the ferry terminal. When we arrived they offered us 150,000 rupiah per person for the ferry plus bus to Denpasar. If you take one of their minivan or bus it shouldn’t cost you more than 50,000 rupiah per person. The ferry terminal in Banyuwangi is located opposite the train station. From there to go to the centre of Banyuwangi you need to take a yellow minivan or a tricycle. The yellow minivans are like a shared taxi that you can hail and stop wherever you want, as long as it is roughly on their route. Don’t pay more than 5,000 rupiah per person. We stayed at Mahkota Plengkung, a budget / mid range hotel with decent rooms, although a bit old, and a nice pool. The restaurant wasn’t very nice as it is on the side of a very busy road and the food was not amazing. There is a mosque right next to the hotel, but then again, if you plan on hiking for sunrise then you won’t care since you will be gone before the 4am prayer call. We stayed 3 nights in Banyuwangi so for us it was the best hotel : a little bit more comfortable than some budget hotels because of the pool and the size of the room, and it was right between the city centre and the train station and ferry terminal. Check out their reviews and book a room. There are plenty of other hotels, guesthouses and homestays in Banyuwangi to suit any budget. If you are staying in Banyuwangi only for one night to visit Ijen, I wouldn’t be too picky on your accommodation since you’re almost not going to sleep in your room anyway. 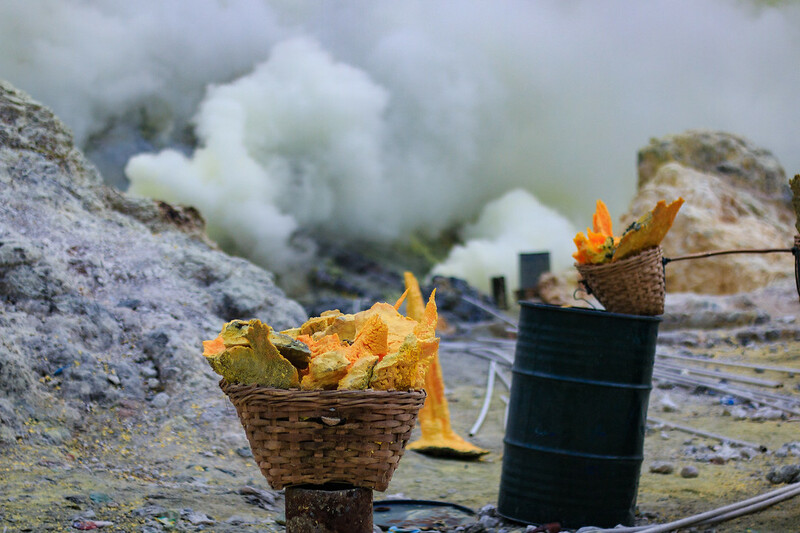 Once you are in Banyuwangi, you still need to arrange transportation to go to the entrance of Ijen volcano located here. You basically have 2 options : hire a private driver or rent a scooter. We went around the city of Banyuwangi trying to find a driver that would take us to the car park, wait for us and drive us back to the city, all that for a decent price. We failed. We went to the official tourism board office and booked a car with a driver, gas masks and water bottles included, for 500,000 rupiah. Hiring a private car and driver is probably the best option if you are travelling with other people, that way you can share the costs. Feel free to ask your guesthouse or hotel, they usually have a driver. You could also rent a scooter in town and drive yourself to the car park. The ride is about 1 – 1 hour and a half, maybe two hours since you’ll probably go slower than a car. The road is ok for Southeast-Asian standards, some pot holes and a bit steep at times but generally ok. It might rain though. If you have driven a scooter before on some hilly roads of any other country in Southeast Asia, like the Mae Hong Son loop or simply the road from Chiang Mai to Pai in Thailand, you will be just fine. Even though we usually prefer to rent a scooter and do it on our own, this time we chose a driver because we had to leave at Midnight, to be there on time for the opening at 2am. And then hike up for 2 hours. So we didn’t want to arrive wet and exhausted. But it’s doable if you want to save money. Climbing Mount Ijen for sunrise is not easy. 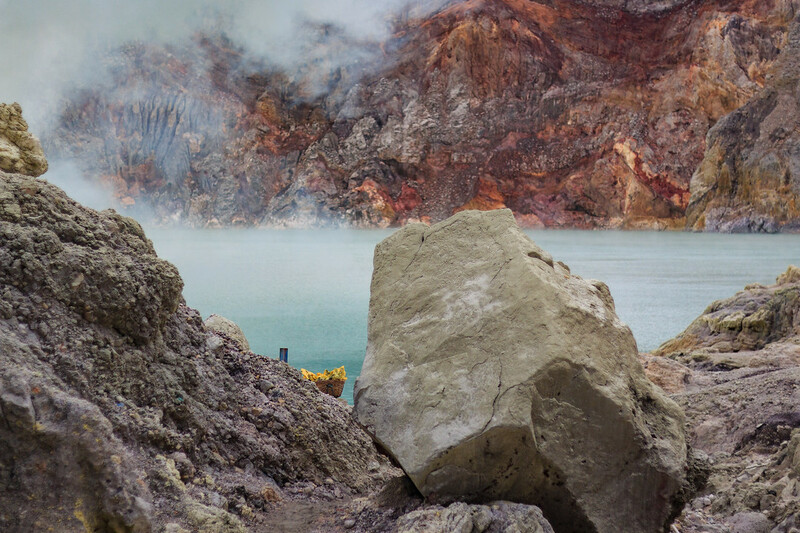 Ijen is about an hour / an hour and a half drive away from Banyuwangi. It takes about 2 hours / 2 hours and a half to climb and get down to the crater. You will have to leave Banyuwangi between midnight and half midnight if you want to be on time to see the blue flames at night, before the sun rises. Honestly, it is not worth it to see Ijen after 8am. That’s when the fog sets in and you won’t see past 5 meters. But going to Ijen for sunrise doesn’t mean you will catch the sunrise. You actually won’t see it as it rises behind the mountain. 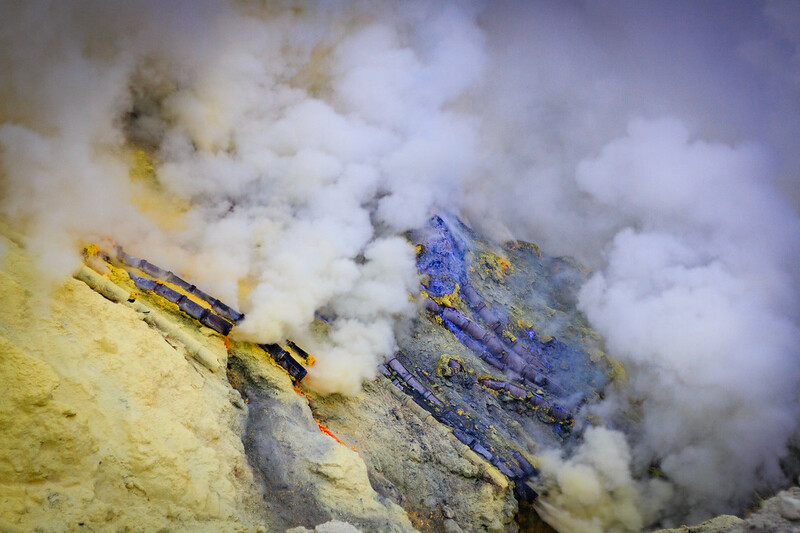 It is worth it though, to see the famous blue flames in the crater. And for that, you need to get up in the middle of the night and arrive there when it’s dark. 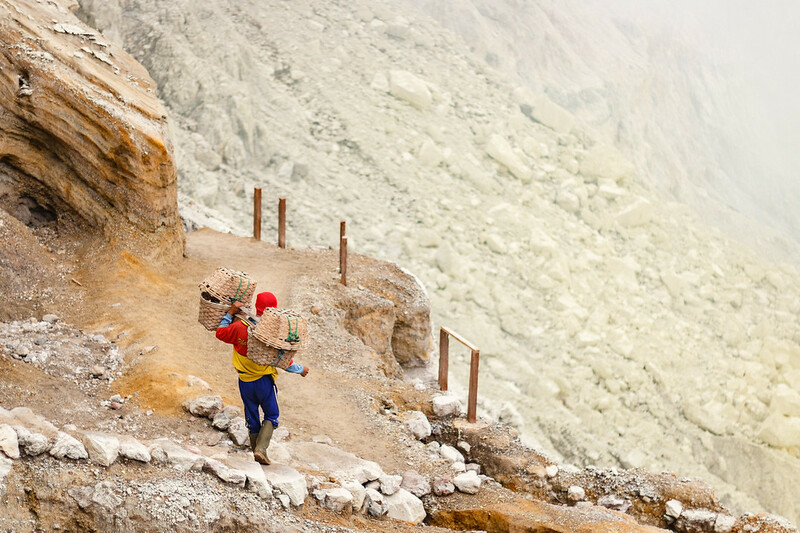 Kawah Ijen is a working sulfur mine. 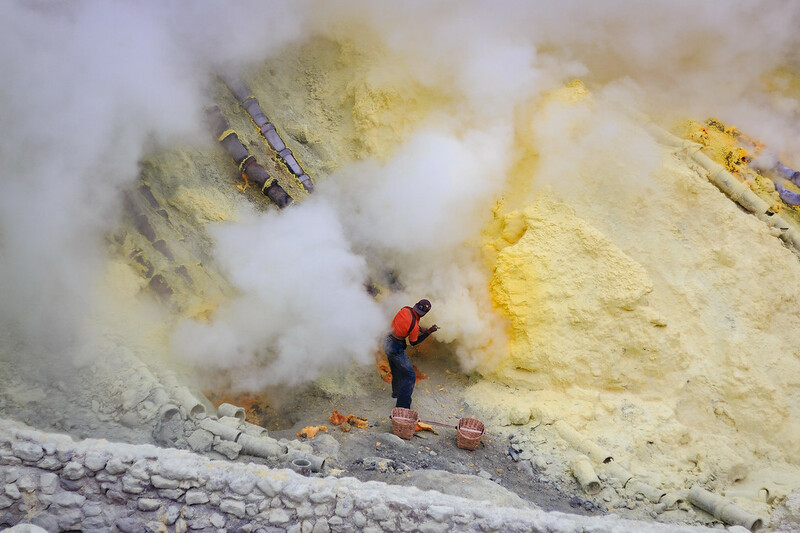 Men are mining the sulfur down in the crater, exposed to the sulfuric gases, and most of the time without a gas mask on because they don’t have enough money to buy one. 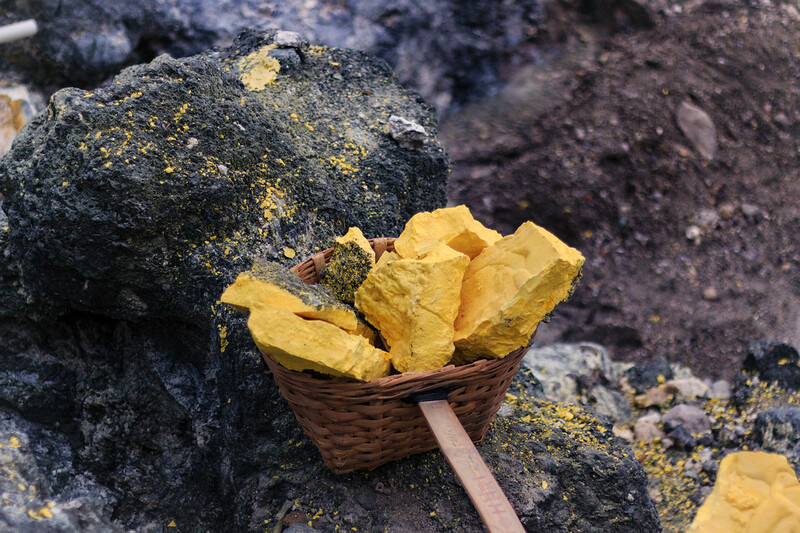 Once the sulfur is solidified, they carry it in a basket weighing up to 80kgs, on one shoulder. Which tends to distort their spines. 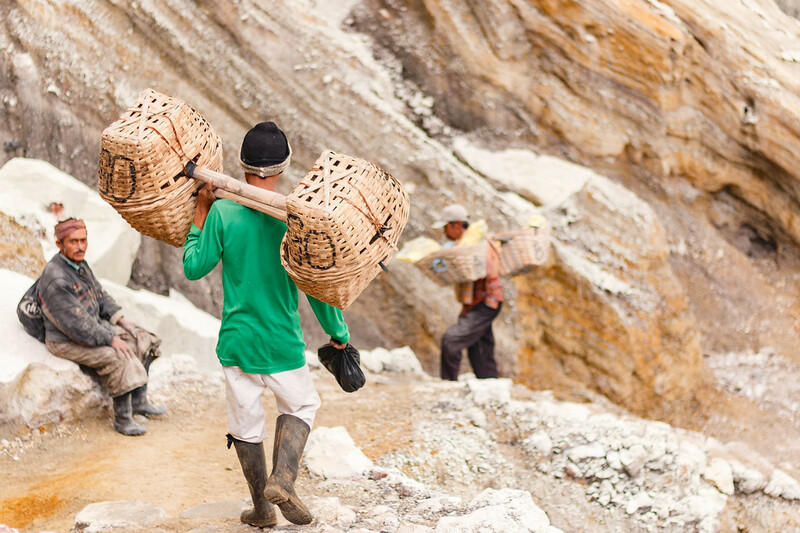 They go back up and down the volcano on 4 kilometers, twice a day for around 10$ a day (they earn between 10,000 and 15,000 rupiah for 10kg. 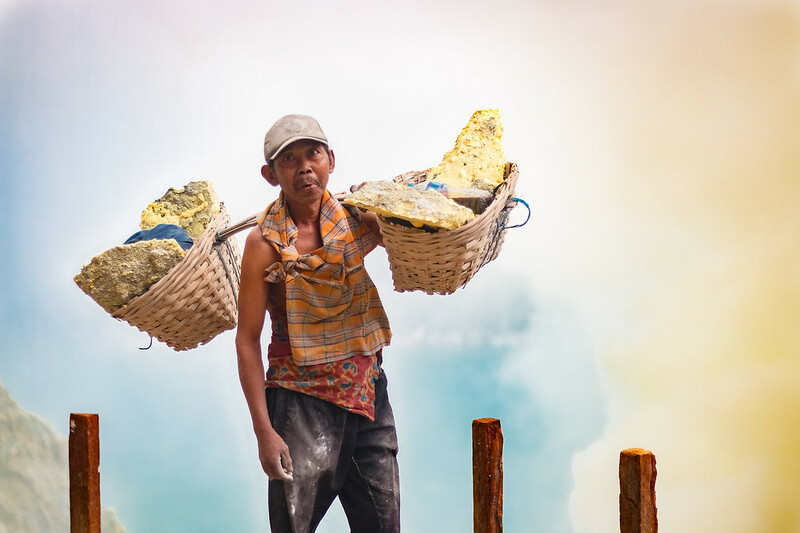 As they see many tourists visiting Ijen, they will ask you for money if you want to take a picture or ask for cigarettes or sweets to ease the pain in their throat due to the toxic gases. Some of them will offer to carry you up on a cart or guide you down the crater. Up to you to say yes to any of those services, although you definitely don’t need to be guided as you just need to follow the hordes of other tourists doing exactly the same thing. Do remember to give the workers space while going down and up the crater, the path can be narrow and they can’t be waiting behind groups of tourists while carrying 80kgs on one shoulder. By clicking on some of the links in this post and going through with a booking, you help support this site at no extra cost to you. Thank you ! Hey bro, the latest info ,now can visit to ijen by using the plane from jakarta / surabaya to banyuwangi airport directly..
Oh okay thanks for the update ! Hi, I am planning a trip to see Mt Bromo and Mt Ijen. I will be doing a sunrise hike to Mt Bromo and planned on getting transportation back down to Probolinggo after the hike to catch a train to Banyuwangi to stay at Kampung Osing Inn the next night. I realize there are trains that travel from Probolinggo to Banyuwangi and wondered your input on if those tickets should be booked ahead of time or best to wait until the day of as I’m not sure what time I’ll get to the Probolinggo train station from Mt Bromo? Any advice would be greatly appreciated! Hi MacKenzie, glad you reached out. Those trains dont usually need to be booked in advance but in your case I would personally book it in advance since you seem to have quite a tight schedule. Is there any way you can spend another night at Bromo just to make sure you’re not missing your train ? 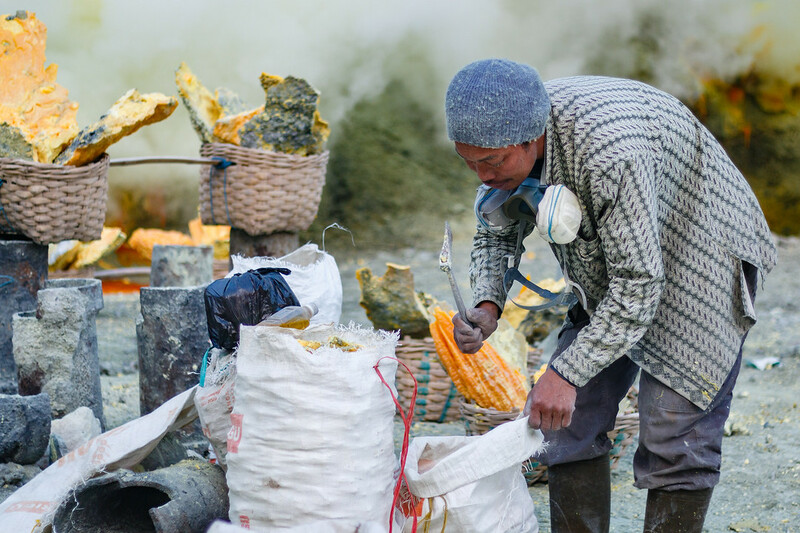 Getting to Probolinggo from Bromo can take time because there are no timed shuttles. The guys who drive there wait until they have enough people to fill the van to leave. If you have no choice but to leave right after your hike, maybe book a train ad late as possible. I hope this helps. Enjoy ! Thanks for the great description and photos, just had one question. From what I have read most of the minivan transports/tours have a midnight pickup and have you coming down from the mountain around 7:30AM. Was this your experience? Is it enough time to appreciate the experience? Thanks for the great sharing 🙂 I was informed that one wouldn’t be allowed to do down to see the blue fires without a local guide. I’m wondering if this is true? From your article, it seems like you could just follow the crowd down.